Children need guidance in schools during their formative years. But often it’s not enough to simply tell them to stop doing a behavior, because negative language may provide the opposite resolution of what the teacher intended. Instead, positive language can be utilized, which not only causes children to think, but is more likely to get them to do what you need them to do. How teachers speak to children can be important for having a successful classroom. Children are there for more than the teacher’s convenience, yet too many times their language to disruptive students can have a demoralizing effect. Positive language can be used not only enforce positive behavior, but provide a non-threatening way to reason with a child to improve their bad behavior. Positive language can be used instead of disciplinary behavior. Using positive teacher language will help children in schools to develop their own self-controls and build positive relationships. And it’s all directly based on how teachers talk to them. Children can be encouraged or they can be demoralized. It’s no surprise that you’re going to have a better child when they are encouraged. It’s these experiences that children have when they’re young that they’re going to take with them throughout life. It doesn’t matter if it was a special kindness from a teacher, or a terrible humiliation used in punishment. Many teachers can forget how their words can affect a child and how they can be influencers during early development. Instead, positive language can be used to empower a child’s best efforts to look after themselves, to look after each other, and care for the environment. It’s these cares that they’ll bring with them into adulthood. Using positive language in the classroom may take more than overnight. It takes awareness and practice. In fact, it may be more difficult for the teacher to relearn this positive behavior than to deal with disruptive children. It’s certainly easy enough to berate children when they’ve gone astray, but taking some thought into using positive language instead will take more effort. And yet, taking the time with children can be one of the single most important components to developing a well-balanced child. Positive language is part of the responsive classroom approach. The most important goal is to empower children and to continue encouraging them. Children will continue to be encouraged when their attempts are acknowledged, and when they also meet expectations. There are some techniques to reinforce positive language. You can ensure that you’re specific and direct with them, so children have a solid understanding of what is expected of them, and that they receive a direct thank you. Speaking specifically to one child can help them to understand the message is about them. You can also stress deed, and not a doer. This doesn’t single out one person, but instead presents an action that you’d like done, for example, picking up paper off the floor, rather than singling out the child who dropped their paper on the floor. 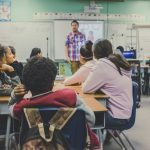 There are many other techniques that can also be utilised to reinforce positive language in the classroom, which will provide a better learning experience for the students.